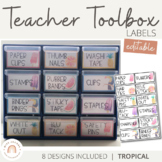 These labels are designed to fit the 12-drawer storage compartment from Bunnings Warehouse. 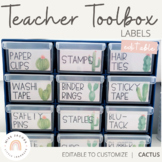 Labels are editable. 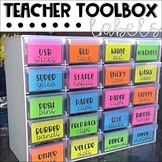 Completely editable labels for the 20 drawer organiser (fits best the 20 drawer organiser from Bunnings). If you would like to use the font as shown in the preview, you will need to download the font: 'AG Boss Lady' by Amy Groesbeck through TpT. 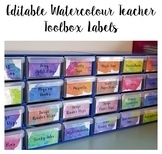 Non-editable labels for the 20 drawer organiser (fits best the 20 drawer organiser from Bunnings). 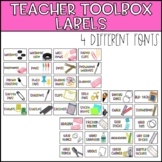 If you would like to edit these labels, please download the 'EDITABLE 20 Drawer Teacher Toolbox Labels' document from my TpT store. Black background with blue and green pattern! Editable and easy to use. Made to fit PERFECTLY in the Bunnings 12 draw toolbox! These labels best fit the Bunnings 20 drawer compartment organiser! Please contact me if you would like any additional labels added.